What started out as a single food trailer has become a mini empire. 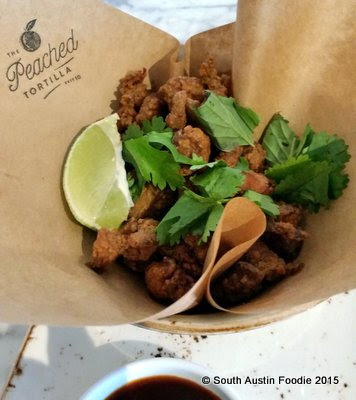 The Peached Tortilla now has two roving trucks and graduated to a brick and mortar establishment in December 2014 at 5520 Burnet Road, in the heart of the ever-changing Allendale neighborhood. We arrived around 5:30 pm, and headed to the eight-seat bar for the social hour menu. My friend had been a few times before, and remembered affable and highly skilled barman Kevin. It was a treat to watch him throughout the evening, as he was adroitly mixing drinks directly in front of us, while chatting with us and training a newer bartender. 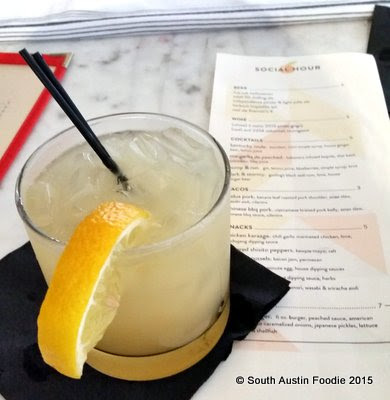 I had the Kentucky Mule, a twist on a Moscow Mule, using bourbon instead of vodka. Kevin also gave us a taste of just the plain ginger beer (that he makes!) which was pungent and refreshing on its own. From the social hour menu, we got three items to snack on, starting with the chicken karaage which were nice and crisp. Great texture and not at all greasy. The menu says it's a gochujang dipping sauce; this one had more of a soy flavor than a pronounced chile/spicy taste but it was well rounded and perfect with the chicken. Kimchi arancini balls with two different aiolis, sriracha and wasabi. The sriracha was definitely the winner of the sauces; I am not the biggest wasabi fan, but had a hard time really detecting any wasabi flavor. The rice balls were also breaded and fried well, and were nice a savory on their own. 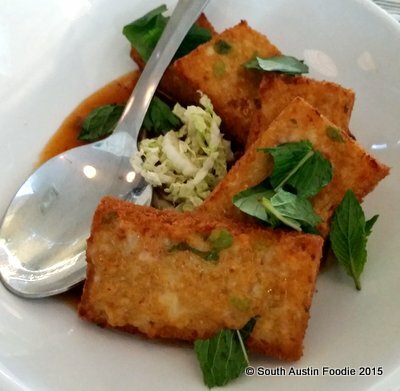 What's called Mom's Toast on the menu is a shrimp toast also with a gochujang sauce. I LOVED these! Super crisp and tasty. The sauce here seemed a bit sweet, but was a good foil to the salty fried goodness. I am now craving these. All the time. After the appetizers, neither of us were exactly starving, but didn't feel that we should miss the opportunity to order off the regular menu for dinner. My friend had previously had the Thai Chop Chop Salad, and I thought it would be a good choice after the fried foods. 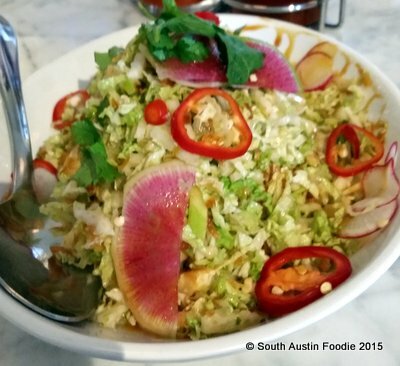 It's got Napa cabbage, fried tofu and shallots, green apple, fresno peppers, watermelon radishes, puffed rice, Thai vinaigrette and fish sauce caramel in it. I really enjoyed the medley of texture and flavors, though I didn't really find much apple or peanuts in it. I ate about a third of it and took the rest home for lunch the next day. Unfortunately, with the puffed rice, this salad did not hold up well overnight, so I would not recommend taking it as leftovers. 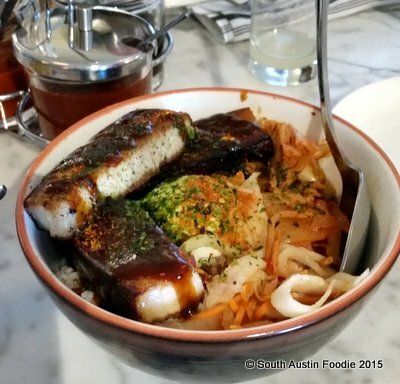 Here's my friend's dish; I can see how the Lush Pork Belly Bowl got its name! The pork was SO good! Nice thick meaty pieces that were cooked well. I've had a couple people tell me that's their favorite dish there, and I can see why. You can't really tell from the picture, but that's a 45 minute soft-boiled egg in the middle of the bowl, and there's rice underneath. I don't regret the chop salad, but this would be real hard to pass up in the future. Overall, a really good first experience at the Peached Tortilla! If you can get there for social hour (5 - 7 pm), I can definitely recommend sitting at the bar and enjoying some food there. By the time we left around 7:30ish, the place was packed, and there were a few people waiting for tables. They do have a small patio area outside, but when it's 100 degrees outside (and the patio is on the Burnet Road side), not sure that's much of an option! But if you like Asian fusion, are into different flavors and textures, and are up for creative cocktails, go get Peached! You crossed the river?! 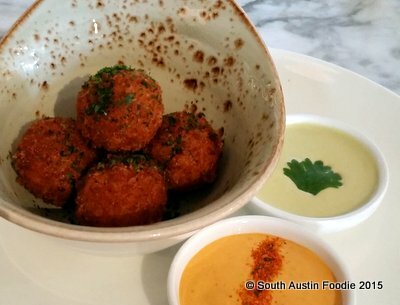 Changing name to North Austin Foodie? Jokes aside, I love The Peached Tortilla. I just wish it was located south especially for brunch. LOL - I do cross the river, for good food! ;) Agreed, they need to open one south! SO glad you had a great experience there. Peached is one of my favorite restaurants in town.